NEW grip-Glove is a quick and easy way to handle any size Fish in a humane way. An essential tool for larger fish and perfect for handling fish out of any type of boat. These gloves make life a whole lot easier. Once you use one you will realize the tremendous advantage. 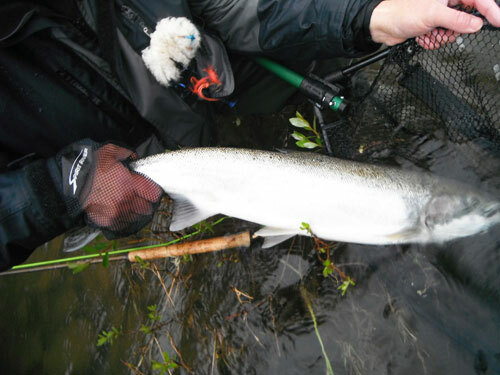 Slip on one of the gloves and you will find it is like Velcro on the wrist of the fish. The perfect tailing glove. In addition we have made a smaller version for women or a small mans hand. Each glove is made with the highest quality netting and is virtually indestructibly. The wrists are wide so they are EZ to slip on even when fighting a fish. We have a unique quick cinch allowing you to simply pull the cord and the glove will cinch up and not fall off. After use the fast drying glove can be rinsed in the water and given a quick brisk shake for storage. It will fit in any pocket and comes with a hook tether. 100% guarantee. PROUDLY MADE IN GLIDE OREGON.